Flash backs of my childhood and the jelly bracelet craze came flying back recently thanks to Silly Bandz. Kids all around are begging parents to take them from store to store looking for these rubber bands that are shaped like butterflies, basketballs, elephants and more. As the mother of a son almost done with first grade, I was curious if he knew about them. 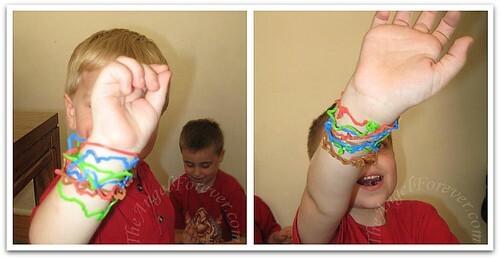 Yes, NHL had seen Silly Bandz on classmates and knew that his cousins had them at JSL’s birthday party. That was pretty much all he knew and cared about. I was relieved that I would not have to be one of those parents that went on a wild goose chase to find these greatly sought after items. This was the case until Friday. Last Friday, after school, I took the boys to the store to get a few items. As we were finishing up our shopping, we ended up in a section that had all things for Toys Story 3. 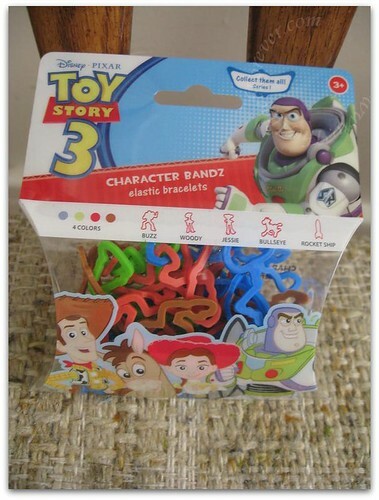 Suddenly, I was face-to-face with packages of Character Bandz. Yes, Disney has signed up with a company to made these bracelets in shapes from Toy Story 3, Cars, Disney Princesses and of course Mickey Mouse. To buy to not to buy? When we opened them up, we found the five designs: Buzz Lightyear, Woody, Jessie, Bullseye, and Rocket Ship. The package showed that there were four colors. Much to my relief, there was one of each color for the five designs. So for $4.00 we received 20 of the bracelets. I set them into piles and had the boys take turns selecting two from each of the characters. Thank goodness, there were no real fights. They were both so happy to have them and put them on. Here are the boys modeling their Toy Story 3 Character Bandz. What has been funny to me is that JSL is more interested in them. NHL wears them for a little while and then wants to put them away. To make sure they are not lost we have snack bags marked with their names. If they come off their wrist, they must go into the bag. So far so good. The best part, the boys are not begging for more. They seem content with these. Of course, they have not seen the other Disney character options yet either. I guess we shall see what happens if/when we ever see them. 1. What fad do you remember from your childhood? Always curious to see what others have seen/heard by them during this latest craze. i remember the slap bracelets from my day! I really do not remember any fads when I was little. I don’t think we even remember hearing the word Fad,lol. But I have to say I like those bands. My daughter purchased some you a school project and it went over great. Kristen´s last blog post ..To smoke or not to smoke? I also remember jelly shoes and when I was in middle school, the fad was to wear big ol’ hightop tennis shoes with the laces undone – ugh! I shutter to think I actually wore those, LOL! 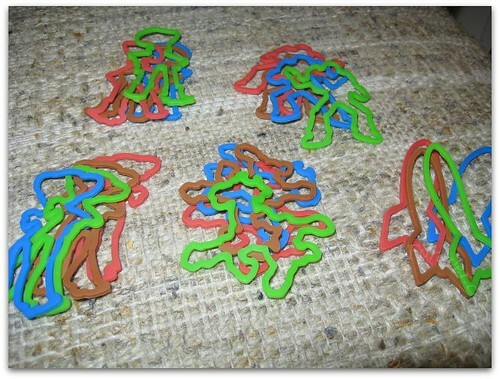 My kids have went crazy for the silly bands – I sure wish I would’ve come up with that idea. No doubt, it’s probably making someone rich. I remember Garbage Pail Kids cards when I was growing up. My son isn’t into the silly bands, thank goodness. My kids were from the Beanie Baby era. Guess what’s sitting up in my attic in a large hefty bag right now…..
Oh yeah I remember friendship bracelets. My boys haven’t said a thing about Silly Bandz and I like it that way! Alex is too much into Bakugans right now to care about anything else. 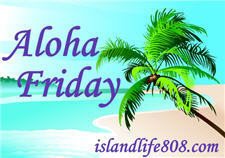 twincerely,Olga´s last blog post ..Aloha Friday!!! I loved snap bracelets as a kid, I used to wear them all up and down my arms. My daughter is only 21 months old so we do not have any silly bands in our house right now. I remember making friendship bracelets in jr high and friendship pins for shoes in gradeschool. I also remember the swatch craze, too. My kids love silly bands.